The beginning of the year proved to be promising with ARE pledging partnership with UNIDO to promote sustainable energy access for productive uses in January. We are very proud to enter into this partnership, as the most effective approach to achieve universal energy access is through win-win collaborations between the private and public sectors. By working together, ARE and UNIDO demonstrate their leadership in the fight against energy poverty. More on our partnership in UNIDO’s co-editorial and press release. Further partnership agreements are in the pipeline and will be announced at the 5th ARE Energy Access Investment Forum in Abidjan on 13-14 March 2019, where we expect more than 200 key stakeholders to come. As a late bird offer, we are offering 20 tickets at ARE Member rates. We look forward to having you with us at this early spring milestone event! The Forum is organised by ARE in partnership with the African Development Bank and GET.invest (formerly RECP), and with the support of AIENR, AMDA, Club-ER, ECREEE, SEforALL and UNIDO. The programme will offer a balanced mix of 40 speakers and participants from more than 30 countries coming as well as extra exciting activities such as the B2B meetings, ARE Awards ceremony and five side events. Given that the day before we will hold the ARE AGM also in Abidjan, you can expect best attendance from ARE Members, too! There’s only a few weeks left before registration officially closes. Get your tickets here. To find out how ARE can help you to achieve your business goals, please contact me directly. Since January, we are pleased to welcome three new Member companies: Box Power, Sahay Solar Engineering and Sunkofa Energy! We look forward to working with you! Is industrialisation the driver to encourage universal energy access or is energy access a pre-requisite for industrialisation? If you read the news about the partnership just concluded between UNIDO and ARE, you might be wondering what angle an organisation working towards industrial development has on energy access. We truly believe decentralised energy has the power to develop the local economy by creating homegrown solutions and businesses, maximising local benefits (jobs for women, men and youth) and attracting investments to support up-scaling. While working towards improving energy access, developing countries have a chance to leapfrog into state-of-the art clean energy technologies which will allow them to reach areas that are usually hard to get to. However, while these clean energy technologies will nourish productive activities in these areas, their use is not enough to ensure a sustainable demand for energy services or demonstrate profitable business models. For that to happen, countries need to build an ecosystem that supports industrial transformation, stimulates innovation and enables the creation of industries and service providers along the clean energy value chain. The greatest challenges for start-ups and businesses working in the energy sector in developing countries remain weak capacities, access to high risk capital and enabling policies. Through our programmes, UNIDO provides mentorship and training to entrepreneurs to help them bring their solutions (business models or technologies) to the market and improve their likelihood of accessing finance or attracting investors. We also support them in forming local associations, allowing them to identify common priorities and have a common voice. To achieve the SDG7 targets, the focus should be not only on providing energy access but also on delivering a higher social impact and promoting industrial development. The key will be to work on a market development approach that increases and aggregates the demand for energy and localises the value chain for energy service and technologies, be it for a solar panel or clean cooking fuel. The partnership with ARE will deepen our understanding of private sector needs. It will also allow us to work together on facilitating a constructive dialogue between public and private actors to support a development path that delivers according to local needs and empowers local capacities and communities. Join us at the UNIDO side event “Scaling up homegrown solutions for decentralised energy” at the 5th ARE Energy Access Investment Forum in Abidjan on 14 March 2019 at 11.30am to explore how we can join forces to accelerate progress towards SDG7 and come up with recommendations that move us further along the path to universal energy access. Enerray, an Italian subsidiary of Gruppo Industriale Maccaferri and leader in PV market & fast power and off-grid solutions in 2017 has been awarded with an important off-grid tender issued by the Ministerio de Energía y Minería. The scope of the project was to carry out the supply, installation and maintenance of about 8,500 off-grid systems, which will be installed in eight provinces, covering a total area of ​​approximately 2.8 million km2. Plug the Sun, the JV between these two companies, designs, develops and manufactures innovative off-grid photovoltaic systems which allow easy and reliable access to electricity to people who live in isolated areas. Thanks to patented technology and a 'Made in Italy' design, all Plug the Sun products feature high-density power electronics and intelligent power management systems. In 1999, the Argentinian government implemented the PERMER project to face the energy needs of its rural low-income population. After reforms in the 1990s, the sector could improve efficiency and quality of services, but little the access to rural population. To eliminate the existing economic and technical barriers, the goal of the project is the development of a sustainable energy market in cooperation with the private sector. The aim of the project is to expand access to electricity to rural populations throughout the Argentinian territory, allowing them to enjoy a better quality of life without moving to cities or metropolitan areas and keeping tradition and culture typical of the place where they born. The project is strengthening institutional capacity by providing technical assistance and training programs, especially in relation with renewable energy systems. Before having electricity, Argentina people used candles to light the house, and had to keep doors and windows shut to prevent the wind from blowing them out. Now they are very happy because they have electrical light and a television. There were a range number of different benefits for communities and environment. The substitution of wood like the main resource for energy helped to stop the expending deforestation in many regions. The biggest challenges of the project have been undoubtedly the inland transportation, as the households where the systems have to be installed, are located in isolated areas with extremely difficult access. The project has an important social impact as it provides basic electricity service. Better lighting and access to communication mediums (TV, radio) improved life quality significant of beneficiary families. The hours available per day for work, study and other activities were extended. The mission of Plug the Sun is to continue developing this kind of business. We believe that both renewable energy and access to electricity are fundamental requirements in enabling rural populations to reach a much higher standard of living. The Renewables Academy AG (RENAC), together with its partners SD Strategies and Nedworc Foundation (NWF), has been commissioned by the Asia-Pacific Economic Cooperation (APEC) to execute a comprehensive capacity building and mentoring programme for women from APEC countries. The project was executed to support the career advancement of women working in the field of renewable energy, specifically by developing bankable business plans for the advancement of renewable energy in their home countries and by finding business or finance partners. The project offered online and face-to-face trainings as well as facilitated professional exchange, peer-to-peer mentoring and pitching sessions with potential partners, supporters and finance institutions. Launched in June 2018, 50 women were initially accepted into the programme. The project kicked off with an online phase in which the participants were provided with online learning material and took part in several virtual classrooms followed by an examination. The results obtained were excellent with more than 80% of participants passing the exam successfully. Twenty-two women who successfully completed the online phase and submitted promising business ideas then entered into the mentoring phase. During the five-week period, the women were accompanied by 14 mentoring experts in the field of renewable energies whose mission was to support the further development of the business ideas which would lead towards a complete business plan. The 16 women with the best business plans then participated in a three-day in-person training and a two-day pitching session in Singapore. While the official part of the Empowering Women as Managers in the Renewable Energy Sector initiative ended at November 2018, the journey for the 16 women with the best business plans has only just begun. RENAC Project Director Emilienne Tingwey: "The project offered women from different APEC countries and international experts an excellent platform for exchanging ideas and mutual support beyond the boundaries of the project. It is therefore strongly recommended we repeat the project in order to give other women this unique opportunity. One of the participants has already received a firm commitment from an investor to support her business idea developed during the project." To experience the project’s impact from the participant’s perspective, have a look at the short interview sequences from participants from Chile, Mexico, Indonesia and Thailand. We are a proud Member of ARE. For further information, please visit RENAC‘s website. Around 650 million (50%) people living in Africa have no access to electricity and the next decades challenge is definitively to reduce this drastically. The fact that a large part of Sub-Saharan Africa lives in rural areas make things even more complicated, but paradoxically offer a huge opportunity for innovative start-ups in the energy sector. Start-ups are flexible and can bring disruptive technologies to increase drastically energy access. In the past few years, we have seen many small and mid-size companies working on innovative smarter monitoring system, more efficient sensors and meters, big data, etc. Because when a grid extension to electrify remote areas is too costly, innovation can be the answer in providing not only reliable and clean, but affordable (at least less expensive) access to energy as well. In remote areas where there is no Wi-Fi signal, GSM modules are now able to send SMS messages to the cloud proving data which can be analysed to improve the systems, machine-learning can help to better anticipate the energy management, big data collection can improve investors visibility, innovations in batteries and solar PV contribute to the multiplication of microgrids. Any company, which can innovate, has an opportunity and the market is huge! If there is no doubt that the electrification of Africa will be made partly through innovation, the second challenge is that African start-ups in the energy sector emerge quickly to position Africa at the forefront of its own energy revolution. If Africa manages to do this, it will get a double economic benefit. A first one for the rural communities and small business, which will be electrified, and a second one for the innovative African start-ups. 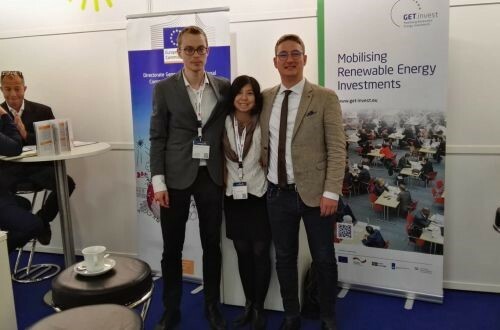 To do this, they need support, funds and visibility and for example events such as the International Cleantech week organised in Annecy (France) are obviously part of the answer as it could be potentially a forum for all these start-ups to present their innovation solutions. This is as well one of the major goals of Deepbloo: giving visibility to these small promising companies in an ecosystem dedicated to the energy sector where they can promote their innovations to thousands of professionals working in Development Finance Institutions and large energy corporations! We are a proud Member of ARE. For further information, please visit Deepbloo’s website. Increasing access to affordable and reliable sustainable energy is essential for long-term economic prosperity and the achievement of the Sustainable Development Goals. It is with this goal in mind that the UNIDO Director General LI Yong, and ARE Executive Director Marcus Wiemann, signed a Memorandum of Understanding (MoU) on 23 January 2019 launching a partnership between the organisations. ARE is an international business association that activates markets for sustainable decentralized energy solutions for rural people in low to middle income countries. UNIDO is the UN agency tasked with promoting inclusive and sustainable industrial development, and increasing access to reliable, affordable and clean energy is an essential part of its mandate. Under this new partnership, the two organisations will collaborate on programmes and projects which promote sustainable energy financing, technologies and solutions globally. “We are very proud to enter into this partnership, as the most effective approach to achieve universal energy access is through win-win collaborations between the private and public sectors. By working together, UNIDO and ARE demonstrate their leadership in the fight against energy poverty,” said Marcus Wiemann. The organisations will develop policy recommendations for decision makers in Africa, Asia and Latin America as well as encourage the creation of renewable energy associations and clean technology clusters at the national and regional levels. The Micro-Grid Academy (MGA) is a regional capacity building platform that provides theoretical and practical training on energy access and decentralised renewable energy solutions to young East-African and international technicians, entrepreneurs and engineers. The project aims to enhance access to energy in rural communities fostering local enterprise and job creation, while positively impacting health and education services, female empowerment, climate change mitigation, reliable water and food production and energy security, in line with the United Nations Sustainable Development Goals (SDGs). Located in KPLC Institute of Energy Studies & Research in Nairobi, Kenya, the MGA is coordinated by ARE Member RES4Africa, in partnership with Enel Foundation, the national Kenyan Utility KPLC, Strathmore University, AVSI Foundation and St. Kizito Vocational Training Institute, and endorsed by EACREEE. To support the theoretical lectures with practical learning, a real 30 kW hybrid mini-grid will be installed on-site thanks to the contribution of RES4Africa members. More than 50 participants from Kenya, Uganda, Tanzania, Zambia, Egypt and Italy took part in the 5th and 6th module of the RES4Africa Microgrid Academy, which focused on O&M and data analysis for micro-grids. The training included an online training module by LED-Safari, a visit to Schneider Electric's factory in Nairobi, as well as a visit to the Kitonyoni mini-grid project assembled by University of Southampton. Jens Jaeger, ARE Policy & Business Development Officer, presented the "Best Practices on Energy Storage for Micro-grids" and "Job Creation & Opportunities in the Micro-grid Sector". Providing support to a limited number of demonstration renewable energy off-grid projects in rural areas of Zambia. As part of its deliverables, the IAEREP Project is supporting the development of a regulatory framework for mini-grids in Zambia. To this effect, the Board of the Energy Regulation Board (ERB) approved the framework for mini-grid regulations comprising licensing, tariffs and technical requirements. The new regulations will apply to the demonstration projects that will receive EU grants support through a Call for Proposals under IAEREP, as well as to other solicited and non-solicited mini-grid projects in rural and peri-urban areas. The regulations will be to be road tested in the process of the upcoming Call for Proposals, and lessons learnt will inform further optimisation of these regulations. In this regard, the ERB would like to invite your organization to participate in a hands-on workshop that will introduce the recently approved Mini-Grid Regulations to the sector stakeholders including relevant government agencies, public and private organisations, co-operating partners, potential project developers and investors. The workshop is scheduled for 6 March 2019 from 09:00 to 16:00 (venue will be announced later). The objective of the workshop is to explain the mini-grid regulations in-depth utilising a concrete mini-grid project case-study and guide the participants through the process of applying the provisions of the approved Mini-Grid Regulations to a project. Over the two-day show there will be eight conference tracks running, featuring over 200 individual presentations. Gain insights on the latest industry trends and disruptions and get updated on the latest investment and development opportunities. The show also includes a buzzing exhibition, with over 250 sponsors and exhibitors, across two floors, showcasing the latest technology in the energy industry. There is simply no better place for you to connect with the industry. Power & Electricity World Philippines brings together the government, leading utilities, power producers, project developers, investors and solution providers to allow new business opportunities and valuable connections to be made. For bookings placed through ARE, there is a 10% discount. ARE is happy to announce that it has established a partnership with AidEx Events to increase participation. ARE Members also benefit from special discount rates. Interested in booking an exhibition booth with a 10% discount or attend with a 15% discount on the participation fee? Working with ARE, this year’s AidEx will include a Pavilion for buyers of Solar and Off-Grid Energy Equipment to meet suppliers. AidEx is a two-day event, which encompasses a conference, exhibition, meeting areas, awards and workshops. Its fundamental aim is to engage the sector at every level and provide a forum for aid & development professionals to meet, source, supply and learn. AidEx was created to help the international aid and development community engage the private sector in a neutral setting, drive innovation and support the ever-growing need for emergency aid and development programmes. Solar products are at the heart of the exhibition and we hope you will consider having an exhibition stand in this Solar Pavilion. For bookings placed through ARE, there is also a 10% discount. The 24th edition of the Climate conference, known as COP24 took place from 2-14 December 2018. World leaders, international institutions, private sector, climate groups and other civil society organisations gathered in Katowice, Poland, to discuss global ambitions to protect the climate and define adaptation and mitigation measures to protect the most vulnerable countries. David Lecoque, ARE Policy & Business Development Manager, addressed how we can improve access to finance and scale up rural electrification in Africa at the "Innovative climate finance to escalate private sector investment in decentralised energy access" and the "Inclusive Finance for Energy Access" side events organised by ARE Member Hivos. Together with Intersolar India, ARE organised its Micro-grid Workshop in Bangalore on 13 December 2018. Special thanks go to GE India and Sterling & Wilson, who sponsored to make both the workshop and networking reception happen. Around 45 participants attended the workshop, including ARE Members GE India, Mlinda, LED-Safari, Schneider Electric, Powerblox, CES India, Sterling & Wilson, Studer Innotec and Trojan Battery. Promoted business and project development in the decentralised renewable energy sector in India. ARE will be holding its Annual General Meeting (AGM) a day ahead of the 5th ARE Energy Access Investment Forum. This is an opportunity for ARE Members to sit down with the rest of the Membership and the Board to discuss ARE's future strategy and direction. The AGM will help to determine what the Secretariat should be spending more time on in order to provide for best services for its Members. ARE will also be holding the ARE Board and President elections. The Forum, supported by Club-ER, ECREEE, SEforALL and UNIDO, convenes public, private and other stakeholders with the goal to boost clean energy access globally and in particular in Africa, where 588 million people still lack electricity. To intensify the exchange with players from and outside Africa, ARE will also hold its Annual General Meeting in conjunction with the Forum the day before. Over 200 participants are expected to attend the Forum. For the full programme and side events, see agenda. Last chance to register and sponsor! As the exclusive off-grid partner at Intersolar, ARE is partnering with the German Federal Ministry of Economic Development and Cooperation (BMZ) and the German Solar Association (BSW) to organise the Off-Grid Power Forum: Conference & Exhibition. The Forum is an opportunity for companies and project developers to attract and to raise interest from high-ranking delegations, project partners, policy makers, investors and international press members and learn about the latest off-grid trends on future markets, technological solutions and smart applications. This guide was developed by GOGLA with the support of the joint World Bank/IFC Lighting Global Program, the U.S. Government-led Power Africa initiative, Sustainable Energy for All; and the African Development Bank (AfDB). It reflects these organisations' shared views with regards to key policy and regulatory issues in the standalone, oﬀ-grid solar sector. Technical advice was received from ESMAP and DFID. With over a billion people not yet served by modern electricity and just 12 years to go until the 2030 target, achieving universal energy access will be challenging. According to the Sustainable Energy for All (SEforALL) initiative, governments are rising to the challenge, but faster progress is needed. We are committed to supporting governments in their efforts to design pro-investment, standalone, off-grid solar policies and regulations. To that end, this guide provides a holistic overview of issues for consideration in the design of policies and programmes intended to deliver on energy access goals. One billion people live daily without electricity. Close to three billion don’t have access to clean cooking solutions and the exposure to biomass smoke cause millions of deaths each year, mostly among women and children. At the same time, women are the main users of household energy. If properly engaged in the supply chain, women can play a crucial role in moving forward towards energy access for all and the poverty reduction requested by the 2030 Agenda for Sustainable Development. In this belief, over the past 4 years (2014-2018) ENERGIA has been working towards developing women-led enterprises in the energy sector through its Women’s Economic Empowerment (WEE) programme and it is delighted to release a new publication titled “Supporting last-mile women energy entrepreneurs: What works and what does not”, result of the work in seven countries with five leading partners. This new publication examines, analyses and presents models and strategies experienced during the implementation of the WEE programme, describing successful approaches, together with failures. Together with its partners, ENERGIA has supported 4,153 women, delivering clean energy products and services to more than 2.9 million consumers, mostly in rural areas and in low-income communities. The 2018 Global Off-Grid Solar Market Trends Report is the fourth report in a biennial series established over the past 8 years as the report of record for the off-grid solar industry. While the Lighting Global/GOGLA franchise of six-month market updates (H1 2017, H2 2016) serve as the go-to source of information for investors, industry members, policymakers, and other stakeholders in the off-grid solar space, the flagship Market Trends Report provides an opportunity to step back for reflection on long-term trends, challenges and opportunities—illuminating a path forward for the sector. The 2018 publication takes stock of the industry across six axes: market fundamentals, sales, the competitive landscape, finance, the enabling environment, and impact. It provides in-depth analysis on current market dynamics, projections for the coming five years, and a blueprint for how actors in this market can compete in a swiftly evolving industry ecosystem. The numbers in the report reflect a dynamic young industry that is altering the economic landscape of developing countries while delivering unprecedented development impact. However, the real story of the sector lies in the transformative power of innovation as revolutionary new business models and disruptive technologies continue to emerge across the market. This report provides a compelling view under the hood of that dynamic machine and casts a light on what may lie around the corner.